At this point, construction season is starting to come to a close. The air is getting a little bit colder day by day, and heat waves aren’t quite as intense as they used to be. Well, maybe it’s just a little bit early, but we’re excited for that brilliant period of time when the roads clear up before the snow starts to hit the ground. Sure, this magical driving “season” probably only lasts a few weeks at most, but appreciating the little things in life is what makes everything worth it, especially when it comes to providing commercial and personal insurance to the fine people of the greater Ottawa area. It’s hardly any secret that Ottawans enjoy the brief but extremely enjoyable fall season. Bradley’s Insurance is no exception. The summer heat is…well, rather hot, and the brutal winter temperatures are, as you can guess, brutal. Truly, early autumn is a magical season where one can be comfortable both inside and outside. As much as you’re about to enjoy the next few weeks, however, keep in mind that this is a great time to give late fall and winter preparation some thought. From an insurance standpoint, financially protecting your home and the things within it is priority number one. 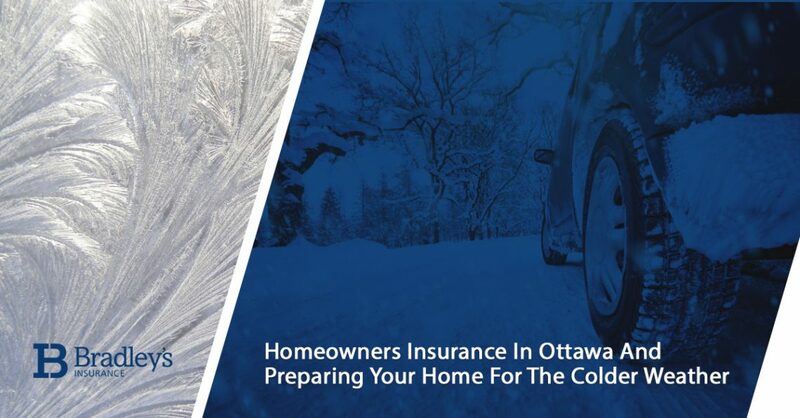 You’ve worked hard to get a house near Ottawa that you truly love, so why risk anything bad happening to it without the protection of a homeowners insurance policy from us? As the seasons continue to change, check out our pointers on transitioning your home from the summer heat to the winter chill this fall season. Should you want to know more about the communities we serve or learn more about securing the right Ottawa house insurance policy, don’t hesitate to contact our friendly team and speak directly with one of our staff members. It’s called “fall” for a reason. Though the trees only tend to shed their leaves for a few weeks before they’re all gone, that means that you’ll have quite the pile of leaves that’ll build up if unattended. Watching the leaves fall is certainly idyllic in a sense, but you’ll want to clear out any leaves and associated debris in your home’s gutter system so as to prevent any buildups or blockage. To go the extra mile and do something a little more green for the earth, consider utilizing your bounty of accumulated leaves for a compost bin. Leaves are a free and easy way to start composting, ensuring that next spring and summer’s gardening feats are the best you’ve ever had. Drafts are going to make the inside of your home unpleasantly chilly, or, at the very least, raise your heating bill to unreasonable premiums. Checking for drafts is relatively easy; simply walk (slowly) around near the edges of your home’s windows and doors with a lit candle. If the flame starts to flicker, you can assume that it’s from a slight draft in the area. Go in and replace any weakened seals or repair the caulking job around your window and/or door frame. Investing in heavy or insulated drapes will also help reduce drafts around windows, saving you even more money on your energy bill. Those who make the mistake of forgetting to turn off and disconnect their hoses outside before the first big freeze of the season tend to do so only once. Before the first freezing temperatures of fall or early winter arrive, go outside and disconnect your garden hose(s), draining them before coiling them up and properly storing them inside. All exterior faucets or water sources around your home should be shut off until the freezing temperatures are done away with late next spring. If your home uses an integrated irrigation system, make sure to blow out your sprinklers before the first big freeze as well. There are a number of fall fertilizers that are designed to protect your grass and prevent winter damage from drying it out and ultimately killing it. Applying a fall fertilizer also helps prevent spring weed growth from occurring, a welcome blessing when you’re finally outside doing some spring yard work and getting things going before the summer. It’s 2018 — if you don’t have a programmable thermostat, then we suggest letting technology save you money on your energy bills in the long run by investing in one of these nifty devices. By setting it to automatically lower your home’s temperature at night and when you’re not around, you’ll be doing the planet and your wallet a huge favor. Not an HVAC guru? Get a professional on the scene. They can test your furnace for any leaks, issues in performance (and, subsequently, efficiency), and change the filter if necessary. A carbon monoxide test is also recommended in order to ensure the safety of your home’s air. Based on how much you’re going to be using your home’s furnace system to keep you and your family warm, don’t skip over this one! If your policy just doesn’t seem to perfectly align with your life situation, our friendly personal insurance brokers in Ottawa can help. Contact us today with any questions. Learn More About Our Amazing Team Today!